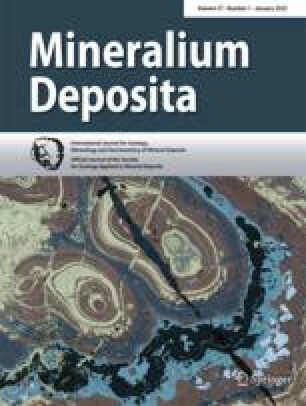 A systematic study of the auriferous quartz veins of the Val-d’Or vein field, Abitibi, Quebec, Canada, demonstrates that the C, O, S isotope composition of silicate, carbonate, borate, oxide, tungstate and sulphide minerals have a range in composition comparable to that previously determined for the whole Superior Province. The oxygen isotope composition of quartz from early quartz–carbonate auriferous veins ranges from 9.4 ‰ to 14.4 ‰ whereas later quartz-tourmaline-carbonate veins have δ18Oquartz values ranging from 9.2 ‰ to 13.8 ‰. Quartz-carbonate veins have carbonate (δ18O: 6.9–12.5 ‰; δ13C: −6.2– −1.9 ‰) and pyrite (δ34S: 1.2 and 1.9 ‰) isotope compositions comparable to those of quartz-tourmaline-carbonate veins (δ18O: 7.9–11.7 ‰; δ13C: −8.0 – −2.4 ‰; δ34S: 0.6–6.0 ‰). δ18Oquartz values in quartz-tourmaline-carbonate veins have a variance comparable to analytical uncertainty at the scale of one locality, irrespective of the type of structure, the texture of the quartz or its position along strike, across strike or down-dip a vein. In contrast, the oxygen isotope composition of quartz in quartz-tourmaline-carbonate veins displays a regional distribution with higher δ18O values in the south-central part of the vein field near the Cadillac Tectonic Zone, and which δ18O values decrease regularly towards the north. Another zone of high δ18O values in the northeast corner of the region and along the trace of the Senneville Fault is separated by a valley of lower δ18O values from the higher values near the Cadillac Tectonic Zone. Oxygen isotope isopleths cut across lithological contacts and tectonic structures. This regional pattern in quartz-tourmaline-carbonate veins is interpreted to be a product of reaction with country rocks and mixing between (1) a deep-seated hydrothermal fluid of metamorphic origin with minimum δ18O=8.5 ‰, δ13C=0.6 ‰ and δ34S=−0.4 ‰, and (2) a supracrustal fluid, most likely Archean seawater with a long history of water-rock exchange and with maximum δ18O=3.9 ‰, δ13 C=−5.6 ‰ and δ34S=5.0 ‰. We thank F. Robert (Barrick Gold) for his early guidance in the field and his continued interest in the project. R. Kerrich and C. Lerouge offered detailed and constructive comments that improved the paper significantly. The research was funded by the Fonds québécois de la recherche sur la nature et les technologies and the National Science and Engineering Research Council of Canada. D. Pitre was the recipient of a scholarship from the National Science and Engineering Research Council of Canada.